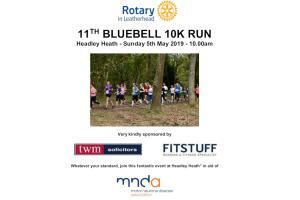 Rotary Club of Leatherhead - Welcome! Local Rotary Club makes record donation! Gary Zabel (third from left), Immediate Past President of Leatherhead Rotary Club, presenting a cheque for £15,000 to Jack Bacon from Prostate Cancer UK, together with local Prostate Cancer UK supporters, Chris Eglinton and Andy Crompton. (L to R) Royal Navy Lieutenant Commander Neel Singh, former Royal Navy Commodore Barry Brooks, Bob Weldon-Gamble, current President of Leatherhead Rotary Club, and Rachel Weldon-Gamble, at this year’s Leatherhead Rotary Trafalgar Night Dinner. Leatherhead Rotary is part of a worldwide organisation of over 1.2 million members in around 30,000 clubs, each with its own character and style. The Leatherhead club was founded in April 1953 and currently has an active membership of around 25 like minded men and women of all ages, whose aim is to help the community; locally, nationally and internationally. GBP 20 per person for two course meal at Fetcham Tandoori. 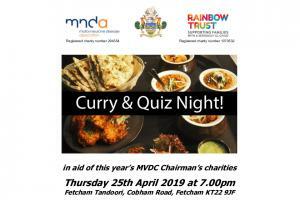 All proceeds go to Motor Neurone Disease Association and Rainbow Trust. 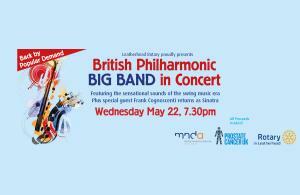 Featuring the sensational sounds of the swing music era, plus special guest Frank Cognoscenti returns as Sinatra!